Once a small fishing village, Kuala Terengganu is now a developing city where skyscrapers often stand shoulder to shoulder with traditional kampong-style houses. Visit Pandak Beach and Batu Buruk beach for some beach relaxation. 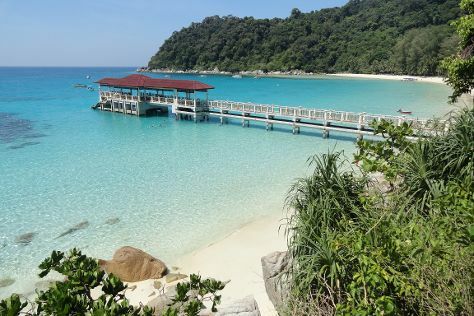 Next up on the itinerary: head off the coast to Perhentian Islands, enjoy the sand and surf at Teluk Kalong Beach, take in the spiritual surroundings of Crystal Mosque, and take a stroll through Kampung China (Chinatown). For other places to visit, photos, where to stay, and more tourist information, you can read our Kuala Terengganu vacation planner. Kota Kinabalu to Kuala Terengganu is an approximately 5-hour flight. In July, plan for daily highs up to 36°C, and evening lows to 28°C. Finish up your sightseeing early on the 31st (Sun) so you can catch the flight back home.